Even she once commented that she didn’t want to live to be 100, but that doesn’t make her absence any easier. I drove by her house in Dorchester a few weeks ago. Selling it was the hardest thing I’ve ever done, because I spent so much time at 10 Trull Street, and Nana had lived there for 54 years. For a place where I never lived, Nana’s house was always home. My sister and I played there with our friends. We ate a million of Nana’s beef stews, chicken, and Lent Salmon. Some of my best memories of life took place at that house. It’s so strange to see how different the house looks now. The repairs and improvements are impressive, yet somehow, each repair, each bit of landscaping, each change puts more distance between me and the days of visiting Nana there. Nana never had much company; Mom handled the bills and made the twice-weekly visits with us in tow, and Dad continued to do repairs as long as he could, but I was Nana’s only regular visitor. That daily stop began when I was five years old — this fact staggers me, because my nephew Colin is that age now, and he’s so little. But I was five, so young that that Dad would cross the street with me as I walked the short distance to Nana’s house. When I was little, the visit was a good living — Nana gave me a dime or quarter when I stopped in, and shoveling the snow would bring in one or two dollars. As I got older, I didn’t accept her money anymore — we had no end of debates about that! When I was older, occasionally I’d bring her in a few cans of beer — that was like Christmas to Nana. It might seem strange to bring someone with a drinking problem beer, but Nana had so very few pleasures in life, and a glass of cold beer was one of them. If I brought in a few cans now and then, Nana wouldn’t make the journey herself and pick up whiskey and get herself in trouble, or take a fall like the one that broke her hip in 1982. Even though her drinking sometimes caused problems in the family, I never judged Nana for this vice; she certainly wasn’t the happiest person you’d ever meet. Running the Uphams Corner Rest Home for over twenty years exposed her to a lot of death and dying, and she tended to be very melancholy, and often downright depressing. My Mom has certainly earned a place in Heaven for the many, many visits she made to Nana over the years, sitting patiently while Nana told the same sad stories over and over. Mom was certainly Nana’s best friend. But with me, Nana wasn’t so gloomy. Nana loved to talk, and we spent nearly an hour every day chatting. There were many stories that were repeated again and again, but I know Nana liked to tell them, and I never really minded. As I got older, I became more interested in the family history, and I’d ask Nana questions. I heard the stories of Glendale, Nana’s hometown in Cape Breton Nova Scotia, and the adventures and stories of her family and friends of long ago. I learned about the Glendale fiddle players and step dancers, Nana’s love of the Gaelic language and Scottish heritage, her eight brothers and sisters, life on the farm, the miners of Sydney, coming to America when she was 17 to work, and memories of her dearest friend, Sister Andrea MacVarish, who is alive and well, and celebrating her 101st birthday May 31, 2002. As I grew up, I was able to do more. I made her dinner every night and took her shopping. When I started driving, I tried to take her out every now and then; it always did her good. We might have dinner or just get a coffee at Castle Island. I remember one time I was with Nana and I was pulled over by the state police. As the officer walked over to my side of the car, the first thing he saw was a nice old lady with a cane saying, “Bobby, is everything all right?” and her nice grandson taking her out for a drive. The cop didn’t even give me a warning. As he drove away I turned to Nana, explained what happened, and added, “Nana, from now on, you’re driving everywhere with me!” Nana got a kick out of that. We took other trips as well, and on three occasions we flew to Maryland to visit her sister Florence. Nana was a like a little kid when we traveled and an excellent companion. Nana went on to explain that she was very afraid. She was starting to forget things and not recognize familiar places. I felt so bad and tried to imagine how she must feel, to have lived all those decades and suddenly be so confused about simple things. I’d long since accepted my responsibility toward Nana, but that night put things in a new light. For the first time, I acknowledged that Nana really was getting old, and it occurred to me how often Nana thought about her mortality, and how much she feared being alone. I promised myself that as long as I was alive, Nana would never be alone. For another four years, I visited Nana almost every day. 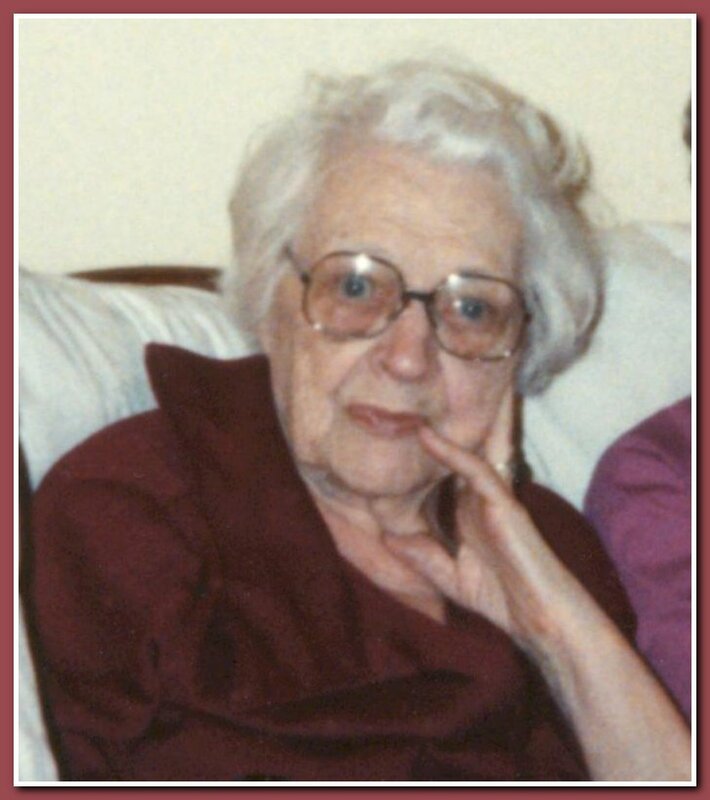 Then, she took a bad fall in June 1992 and finally needed to leave her home, and became a resident of Saint Joseph Rest Home in Dorchester, where she received excellent care. Mom and I continued to visit her regularly. Nana flourished at Saint Joseph. The stroke she suffered in August of 1993 left her in a vegetative state, and mercifully God took her only four months later. It sounds macabre, but one of the greatest blessings God ever gave me was allowing me to be with Nana when she died. I know she was aware that I was right there, saying the rosary, holding her hand as she died. We buried Nana on my 29th birthday. Losing Nana devastated me like no other loss in my life. Even losing Dad wasn’t a blow of this magnitude. Suddenly, I had no one to take care of. I didn’t need to be anywhere in the evening anymore. And I hated it. I hated not being able to see Nana and help take care of her. The years passed and I grieved, and I ended up writing a book about Nana and her life. It was part journal, and part grief therapy. It ended up being a loving tribute and helped me through the loss. me. She was my best friend growing up — I just didn’t know it. If things were bad at school, I could go to Nana’s. If I was upset at home, I could go to Nana’s. We never had heart-to-heart conversations and I rarely told her my problems, but somehow just being with her — in a place where I was unconditionally loved and accepted — made all the difference. Even if everything else was going wrong, I could see Nana, make her a cup of tea (no sugar!) or something to eat, or do some work on the house. Nana’s house was my haven. Nana took care of me in ways she never imagined. This recent realization has helped me to understand just why losing Nana was so absolutely devastating, and the unexpected truth that I grew up, and stopped being a kid, on the day Nana died. The Good Lord helps us heal over time. Nana’s death hasn’t hurt for a long while, but I miss her stories, the complaining about her arthritis, the Cape Breton accent, and just feeling so happy to be with her. Nana gave me so much. It’s because of Nana that I love senior citizens so much, and recognize them for the treasure they are. It’s because of her that I am interested in my family history, and history in general. It’s because of her that I want to help other people. Despite her melancholy and often-gloomy outlook on life, she was wiser than she ever imagined and made a great difference in my life. For that and so much more, I am so very grateful to her. Rest in peace Nana, and happy 100th. I will always keep your memory alive.